Reload Bonuses: Reload bonuses vary dependent on loyalty level. When you visit Banana Bingo for the first time you could be forgiven for taking one look at the homepage and hitting the back button. Dull is an understatement; the site definitely needs a virtual lick of paint because the first impressions, those that are meant to count, are not good. The brand is part of the Dragonfish network that means the games offered are powered by the 888/Globalcom software. This also means Banana Bingo is home to the £1 million coverall games several times a week and free bingo for all players. Step through the virtual doors, overlooking the dated home page, and you will find a popular gaming experience for the discerning bingo player. It takes just a couple of minutes to register to play with this brand and immediately, with no deposit required, you are able to check out the 90 ball version of the game. Free Bingo All is the no cost room available from 7am until 7pm and there are £1 jackpots on offer every eight minutes. 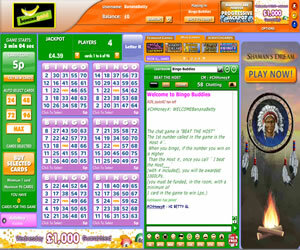 Banana Bingo also host 75 ball games in two variations; there are the standard pattern games and also five line games on offer at this site. 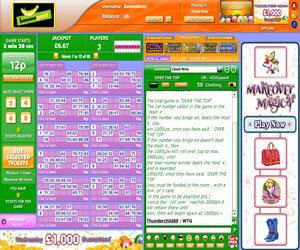 In addition to these you will find a whole plethora of instant win games, some of which are embedded into the game screen. The only pitfall with the embedded mini games is that they make the chat screen really small and hard to follow. Promotions at this site are quite limited in comparison with the standalone brands using the 888/Globalcom product. You'll find popular promotions from the network like Team Bingo but there is nothing available that differs from other brands from Dragonfish. When it comes to jackpot games, as well as the £1 million coverall games, Banana Bingo also have a selection of guaranteed jackpots available each and every day. Some of these are available to pre-buy but are quite limited in numbers. Additionally there are BFF reward games available every day which are offered dependent on your loyalty level with the brand. 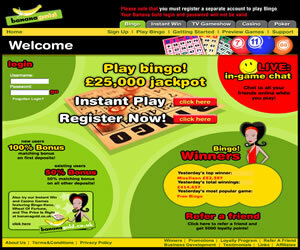 Banana Bingo may not offer anything unique to you as a player but it uses a trusted product on a reputable network so you are assured of a safe gaming environment. 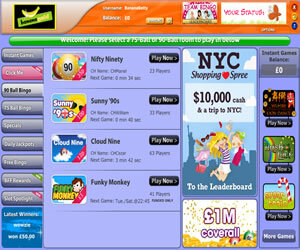 Banana Bingo offers three variants of the bingo game at their site. Most games are either 75 ball pattern or 90 ball bingo but there are rooms that offer 75 ball five-line games too. You will find a selection of instant win games like slots, scratchcards and table games available, some of which can be played in the same room as your bingo. Wagering requirements at Banana Bingo are 4x the amount of deposit and bonus but you can withdraw prior to meeting these requirements. However, should you not have met the wagering then your bonus money in your account at the time of withdrawal will be lost. Before you can withdraw you must have deposited at least £30 into your account.